How many of life’s adventures start with a letter anymore? By a letter, I mean an honest-to-god letter in an envelope sent via US Mail, legitimized with a postage stamp. And by life’s adventures, I mean anything that doesn’t involve me sitting in front of a computer. Before I raise your expectations too high, I’ll tell you what happened: I got a jury summons. Another jury summons. When I tell most people about the summons, they’re full of advice on how to get out of jury service or they’re quick to tell me how they themselves would never be selected to serve on a jury. I instantly feel like a loser. I’ve gone down to the courthouse. I’ve served on a jury. I’ve been someone’s peer. In fact, I’ve been picked for a jury even after filling out a long form that leaves little of my background to the imagination. I didn’t have to misrepresent myself, perjure myself, or conceal anything important. The picky lawyers for both sides thought I’d be just fine. It was an asbestos case, one of the kind that you read about in The Wall Street Journal. One that wastes huge amounts of time and public money. A civil suit where the jury is sent into a room to deliberate about the applicability of legal concepts like negligence, pain and suffering, and punitive damages. Here’s the story from my last jury service. The fellow who brought the suit in this asbestos case was 92 years old. At 90, after a lifetime of exposure to asbestos and asbestos-containing products, he contracted lung disease. 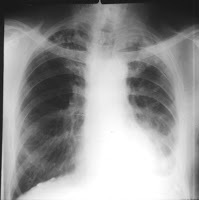 Asbestosis. Not mesothelioma, the instant-death lung disease, but another kind of lung cancer that you can only get from contact with asbestos. There was no doubt that the ambulance chasing law firm that’d latched on to this guy had found a real one. No doubt. They had chased the right ambulance. It was just a matter of narrowing down who to blame and how much it’d cost. By the time the case had gotten to court, the civil suit had been winnowed down to just four defendants. I’m guessing the other 6 or so had already settled. I mean, over a lifetime this guy had done everything you practically can with asbestos. He’d worked in an asbestos mine in the 1930s; in a Navy shipyard (hotbeds of asbestos) during WWII; as a welder (covering himself with asbestos blankets) for 30 years after that. For godssake: he’d even built his own backyard pit barbeque out of cement and raw asbestos, following a recipe he’d found in the April 1960 issue of Popular Mechanics. The wind, you see, had stirred up a lot of asbestos dust while he’d been putting the cement/asbestos mixture into the wooden forms in his backyard and that dust had dived straight into his lungs. Ten years later, in the 1970s, after he’d retired from his day job as a welder, he repaired the sheetrock in his home with asbestos-containing joint compound. In the first 90 years of his life, this nice man had done everything short of wearing asbestos pajamas, brushing his teeth with asbestos toothpaste, and giving his kids stuffed animals woven out of asbestos to play with. I don’t know—maybe he did those things too. I tried to pay close attention, but almost a century’s worth of asbestos exposure is a lot to track. After his lengthy fireproof biography had drawn to a close, and the attorneys for the plaintiff wanted to illustrate what their client had lost, his legal team requested that the old man take the stand and pull out his harmonica. No—really. They did this. And he complied. The fellow pulled out a harmonica, a real blues harp. Was that Sweet Georgia Brown? I don’t remember exactly. But it was a recognizable tune and he could hold it pretty well. I began to wonder: Was his playing supposed to sound anemic? Wheezy? Was it supposed to bring tears to the jurors’ eyes? It was competent harmonica playing by my amateur assessment. Maybe not as loud as it might be, but who plays a harmonica really loud in a courtroom? A courtroom is a dignified place, not a place where you bring that blues harp to your mouth and WAIL, COOL DADDY, WAIL. BLOW THAT HOHNER. No. The California Superior Court is not a nightclub. But even Tangled Up in Blue wouldn’t have gotten the point across. The harmonica might’ve been a mistake on his lead attorney’s part, a young associate from a big Marin law firm, a tall, confident, blond woman in Ann Taylor lawyer-wear. Her law firm specialized in the chasing of slow-moving ambulances—the kind of firm that goes looking for victims of mesothelioma, silicosis, Agent Orange, toxic mold, and oxycontin—litigating the sad cause of the day with gusto. With a human touch, of course. I liked the blond associate. She was trying hard for her client. She had charts and photos to teach us about the perils of asbestos. Expert witnesses were called, examined, and counter-examined. Local standards of industrial hygiene over the last seventy years were explained and analyzed. Back issues of Chest, the Journal of the American College of Chest Physicians were cited. The jury was thoroughly instructed in the facts of the case. Each morning of the month long trial, the attorneys for both sides chipped in and brought the jurors fresh fruit and warm bagels with cream cheese. Coffee and orange juice were served then and at the breaks too. It was very close to pleasant. I’d walk to the Muni early in the morning, the San Francisco streets fresh and scrubbed clean. The homeless folks who sat in doorways were still sober at that time of day and never spit epithets (or anything else) at you. Other people on the street were purposeful; the tourists were still snug abed. When I'd arrive at the courthouse, the jury waiting room would be set up for breakfast. And my fellow jurors were an interesting crew from all over the city—nothing wrong with chatting with them over our tasty breakfast. I’m embarrassed to admit: I enjoyed the experience. I enjoyed jury duty. I enjoyed the thing you’re supposed to do everything in your power to avoid. I even learned something about asbestos and lung disease. 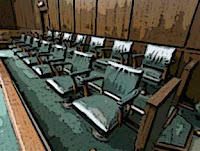 During the jury selection process, one prospective juror, a South Sea Islander by birth, told the lawyer questioning him, “In my country, if someone has an accident and hurts his countryman, he says ‘I’m sorry’ and everyone moves on.” I think he was telling the truth: he seemed genuinely mystified by what was going on in the courtroom. Of course he was excused with no further questions. The rest of us must’ve seemed like the type who could be readily moved by an old guy’s strained harmonica playing. We understood the virtues of litigation and social responsibility. 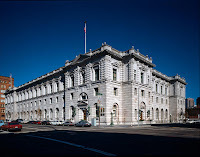 The funny thing was that 25 days or so into the trial, one of the attorneys for the fourth and final defendant revealed that his client, a hardware store in the East Bay, wasn’t even in business at the time the plaintiff claimed to be repairing his walls and using the asbestos-rich joint compound from the defendant’s store. We’d been waiting for the other shoe to drop and there it was. That was the last remaining defendant and there was no way he was responsible. Two other defendants had settled and we’d heard all there was to tell about the third. It was like that moment in Columbo before the final commercial break where everything falls into place. 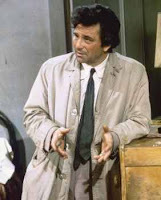 Peter Falk turns and walks away with his raincoat flapping. Done and done. The jury’s deliberations were not hasty. We turned over every last piece of evidence and every judicial instruction and reached a consensus: the remaining defendant was not guilty. There was no reasonable way in 1960 for the Mom and Pop lumberyard that sold the plaintiff the raw asbestos for his backyard BBQ project to be aware of recent developments in industrial hygiene. They were not negligent. Heck, they’d been out of business for the last 25 years or so. It’s a little anticlimactic when a month-long trial peters out like that. But it was also satisfying, like a good paperback detective novel. The jury was in unanimous agreement. We felt sorry for the old guy and his diminished harmonica-playing capacity, but the defendants weren’t guilty and the old guy’s adorable ten-year-old granddaughter (who had been shuttled into the courtroom a previous day for our surreptitious inspection) wasn’t going to get an amazing windfall. The only other time I’d almost served on a jury, I confess that I was disappointed not to have been selected. It was a criminal trial. The young woman, a Stanford freshman, had been charged with shoplifting at a department store in the big snooty Stanford Shopping Center. Her lawyer, who coincidentally was also her father, was prepared to mount an eating disorder defense on her behalf. His daughter, his client, was bulimic and this somehow caused her to compulsively stuff cosmetics from Bloomingdale’s into her purse. Perhaps it was analogous to binge-eating. Her psychiatrist was at the ready; he would offer supporting testimony. For one thing, the young woman entered the courtroom carrying the biggest, most capacious handbag you’ve ever seen. It was ENORMOUS. Winona Ryder herself could’ve fit in the handbag, in fact. Or at least Nicole Richie would’ve fit. It was the biggest handbag I’ve ever seen. Nice too: faux alligator, I think. I prepared myself to stick around and watch the trial anyway. As it turned out as, they settled. The bulimic girl copped a plea. I don’t remember the details of the outcome, but I’ll venture to say that the entire jury was disappointed. So now I have a jury summons and a juror badge number and I’m hot to trot. I’m excited. I hope I get to serve on a jury involving fast food, Tony the Tiger, Michael Jackson, or Phil Spector this time. Dominick Dunne, eat your heart out! I'm rooting for you to be Phil Spector's peer. Because then you'd get to see the hair in person. Have fun fulfilling your civic duty! Back in the 1960s and 1970s, females who were called for jury duty in most upstate NY counties could be excused easily. All they had to do was shyly tell the presiding judge "I can't sit for very long" and the male judges (there were no female judges then) would never ask why. It was an automatic release from jury duty. I'm glad you were selected for jury duty. I think it would be a really valuable experience myself... I don't know why so many people seem to think of it as something to be avoided.